1. 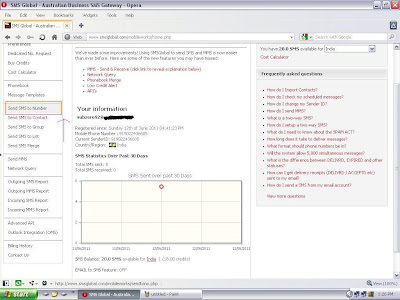 Goto the site www.smsglobal.com and click on the Sign Up option..
2. Now, Fill all detail & its important to fill your valid mobile no. & email because password on it. 3. After you Successfully completed the registration, you will receivea sms on your number. Just use that password and your Username to login. After you successfully login, you will see a similar page. Click on the ‘Send SMS to Number’ option from the Left pane. 4. The First Textbox is for Receiver’s number. Just insert the number which is used to update the status or comment on Facebook through mobile. This number is Country specific. For e.g : In India, its 919232232665. The 91 is the Country Code and the remaing 9232232665 is the real number. So just write your Country specific Facebook Number for Facebook Mobile. 5. The Second Textbox is for Sender’s Number. 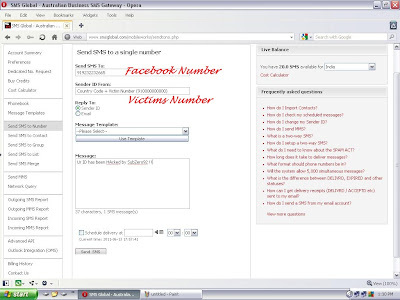 Just write the Mobile number of the Victim who have Activated Facebook Mobile. For e.g : Here its, 911234567890. 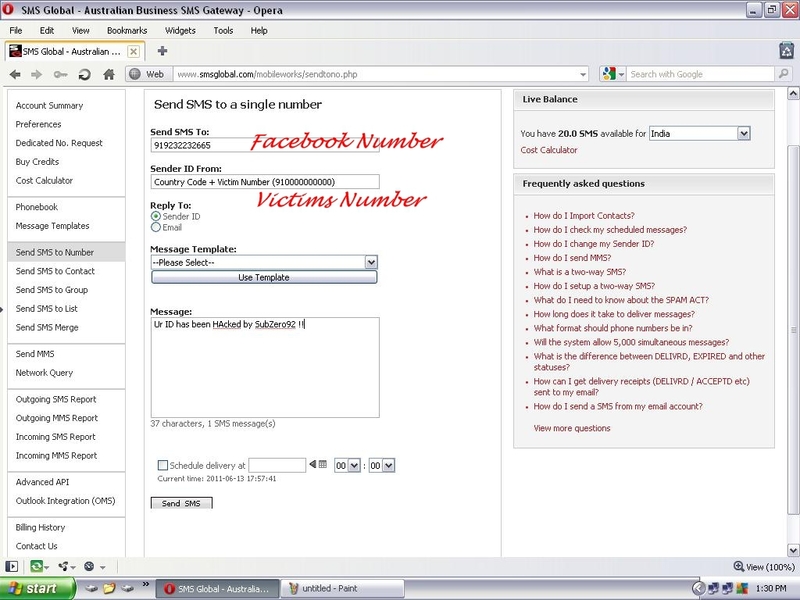 Again, the 91 is for Country Code and the remaining is the Victim’s 10 digit Mobile number. 6. Leave the Message Template option as it is. 7. Write the Message you want to write in the Status of Victim’s Profile. Sometimes, it may take around a minute or 2, so just wait and watch. 1. The Sender’s Number (Facebook Mobile Number) and the Receiver’s Number (Victim’s Number), should be Precedded by the Country Code and then the Number. 2. 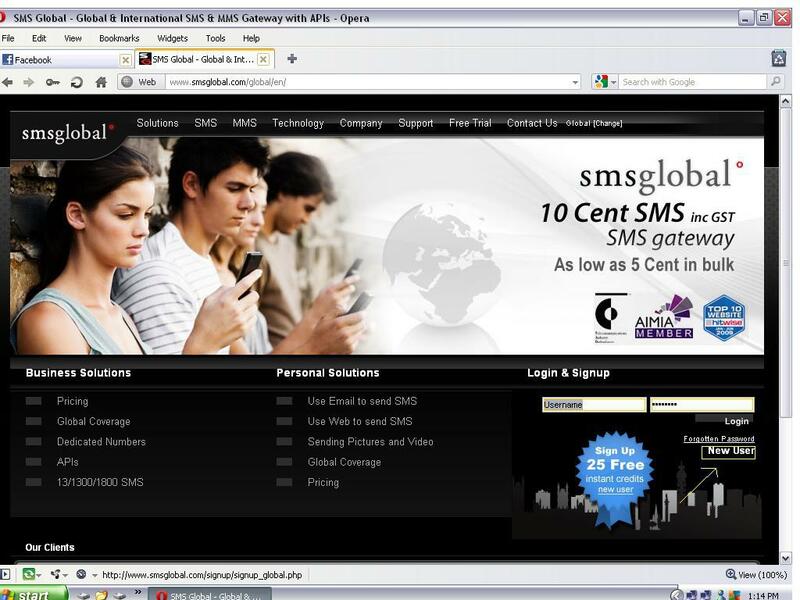 WWW.SMSGLOBAL.COM allows only 25 SMS per Registration. So, as long as you have more Mobile Number to receive Password on it, You can keep trying. 3. This Trick requires the Victim to have Facebook activated on Mobile (Facebook via Mobile). If the Victim has not activated it, the Method is Invain !! Check for the ‘Info’ Option in Profile of the Person you want to victimize. If the ‘Info’ contains the Phone Number, the Chances are high that he/she may have activated the Facebook Mobile. So, Just Try Your Luck !!! Just Paste the Following Link in your Address bar to find out Mobile numbers of all the Freiends in your List !! !